Explanation: Can the Sun be eclipsed twice at the same time? Last Friday was noteworthy because part of the Earth was treated to a rare total eclipse of the Sun. But also on Friday, from a part of the Earth that only saw part of the Sun eclipsed, a second object appeared simultaneously in front of the Sun: the Earth-orbiting International Space Station. 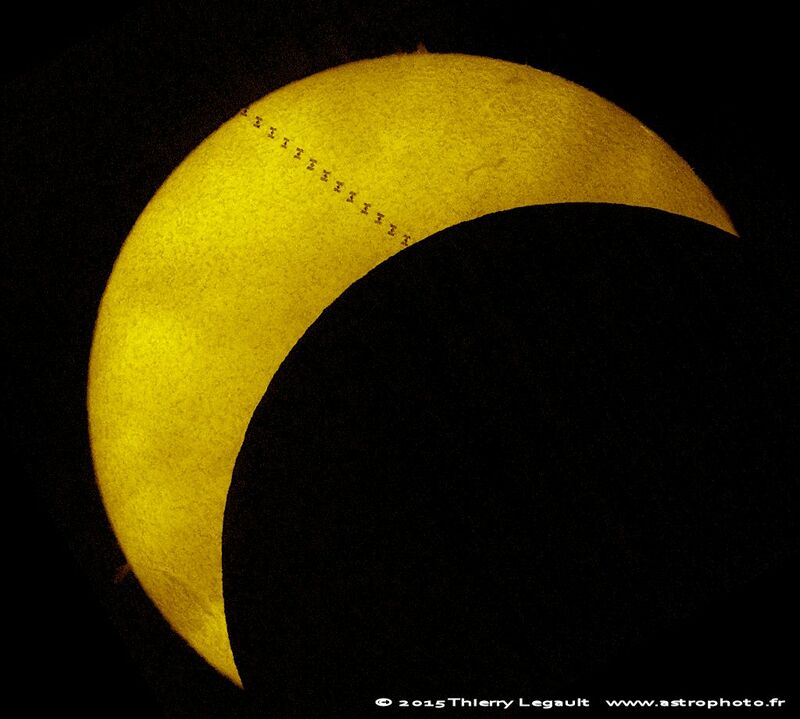 Although space station eclipses are very quick -- in this case only 0.6 seconds, they are not so rare. Capturing this composite image took a lot of planning and a little luck, as the photographer had to dodge a series of third objects that kept, annoyingly, also lining up in front of the Sun: clouds. The above superposed time-lapse sequence was taken from Fregenal de la Sierra in southern Spain. The dark disk of the Moon dominates the lower right, while the Sun's textured surface shows several filaments and, over an edge, a prominence.